Call us biased, but the Special Education faculty and staff are sure that our students are the best around! Our students hold a special place in our hearts. We are excited to welcome you to the Division of Special Education & disAbility Research. 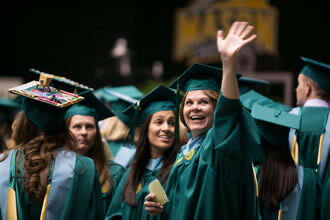 As a student, you are an important part of the Mason community. To help you make the most of your studies, you will find exceptional university, college and division resources to complement your curriculum, including the innovative post-secondary LIFE program that provides hands-on experience, the Assistive Technology lab, the Kellar Library dedicated to physical and intellectual disabilities and special education-related topics, collaborative learning computer labs, career industry advisors, and subject librarians. We encourage you to explore the full range of educational opportunities by participating in workshops, research conferences, and student activities. We hope you will find the educational path you’ve chosen to be both challenging and successful! You Have the Keys to Success! Students are responsible for the content of university communication sent to their Mason e-mail account (@masonlive.gmu.edu) and are required to activate that account and check it regularly. Reminders about deadlines, information on program and schedule changes, etc. will be sent to your Mason email account, so it will be an invaluable resource of information as you progress through your program. IT Support provides technical assistance for the Mason email system and can be reached at 703-993-8870. If you wish to forward your @masonlive.gmu.edu e-mails to a personal account please do so as soon as possible once admitted to avoid missing key communications from various university offices. Friends and other CEHD students are great but they are not reliable sources of information for your individual degree requirements/progress. A reliable resource is a paid Mason employee and the subject matter expert on the question at hand (i.e., Licensure, Endorsements, Advising, Career Services, Admissions, Registrar, ITU Support). When in doubt, ask your advisor!